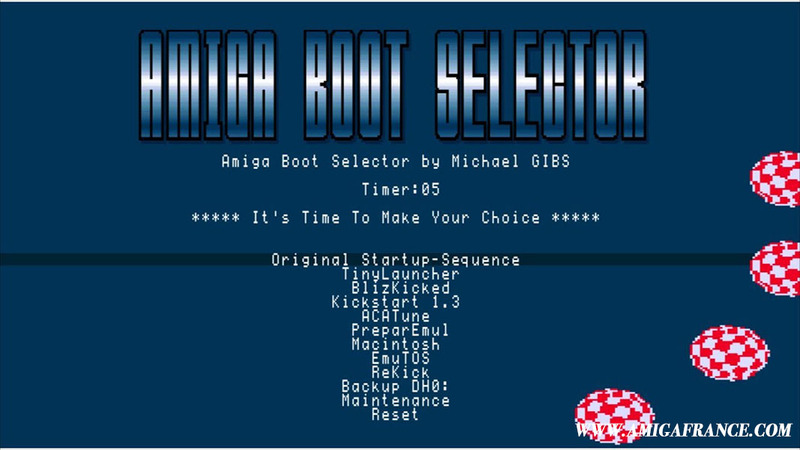 Amiga Boot Selector is a tool that’ll let you choose between many startup-sequence when you power on your Amiga. 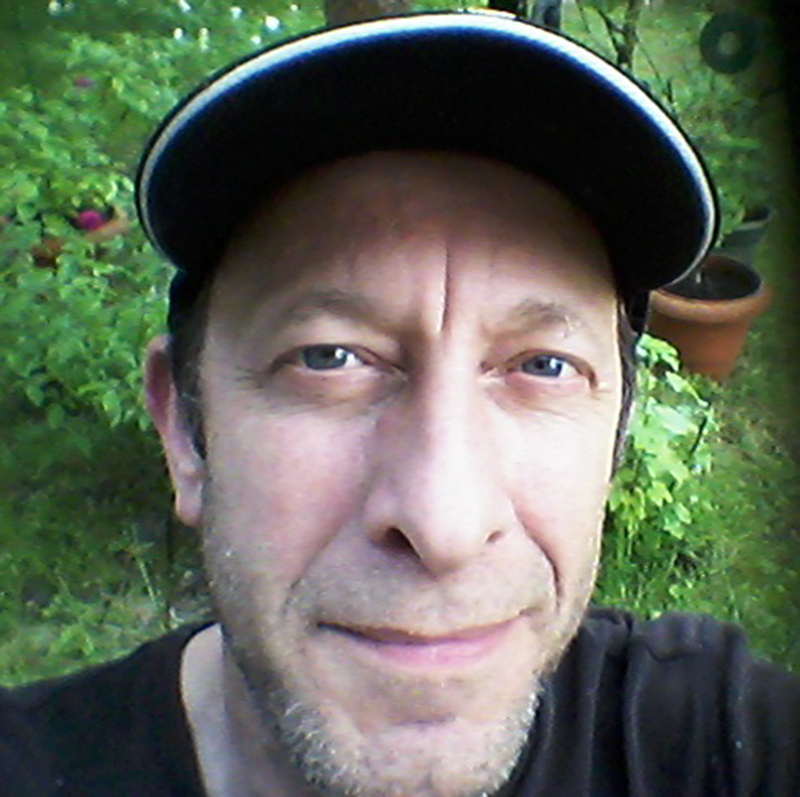 This new release made by Michael Gibs and published this year bring us some new stuff. Zarnal has wrote this step by step « howto » to help you to install, setup and enjoy this « must have » tool. 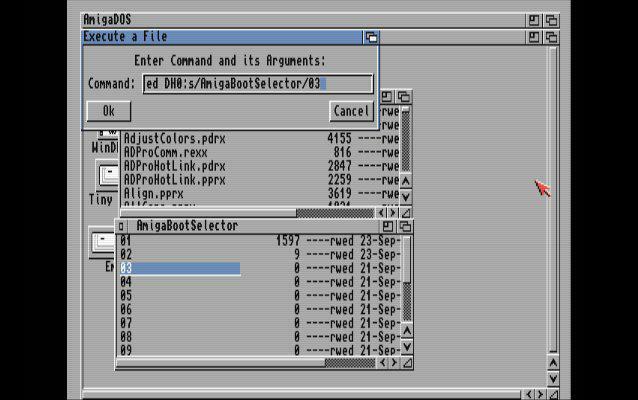 Update 2.06 : If you use Winuae to prepare, be careful don’t use the keyboard as a joystick, otherwise the direction keys will not work in Amiga Boot Selector v2. Caution : Be careful before using the latter if you already have an installed version, you will have to manually delete the file »Options.cfg» in the directory S of your system. Boot from your primary hard drive to your Workbench. Copy abs from the archive to the DH0:c (primary partition) directory. Open DH0:c and select abs, wait a few seconds, the program will go back to the workbench. 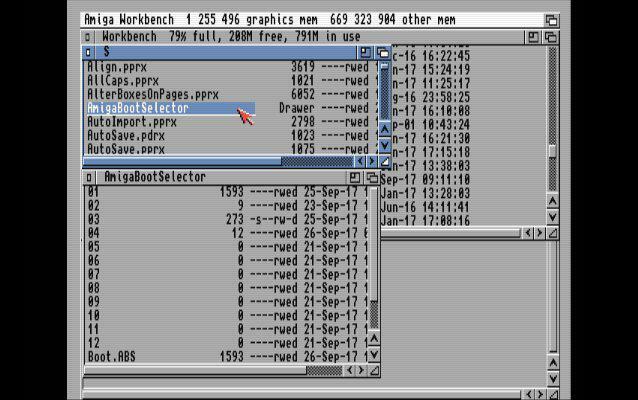 An AmigaBootSelector folder will then be created automatically in DH0:s. Make sure that you have selected in the « Window » menu of the Workbench «Show all files». 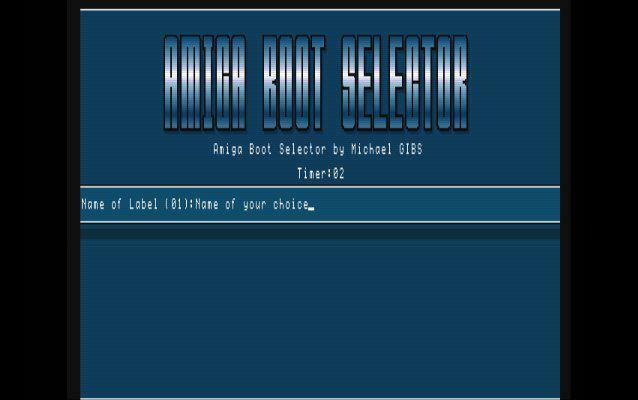 Open DH0:s/AmigaBootSelector. You will notice various files. 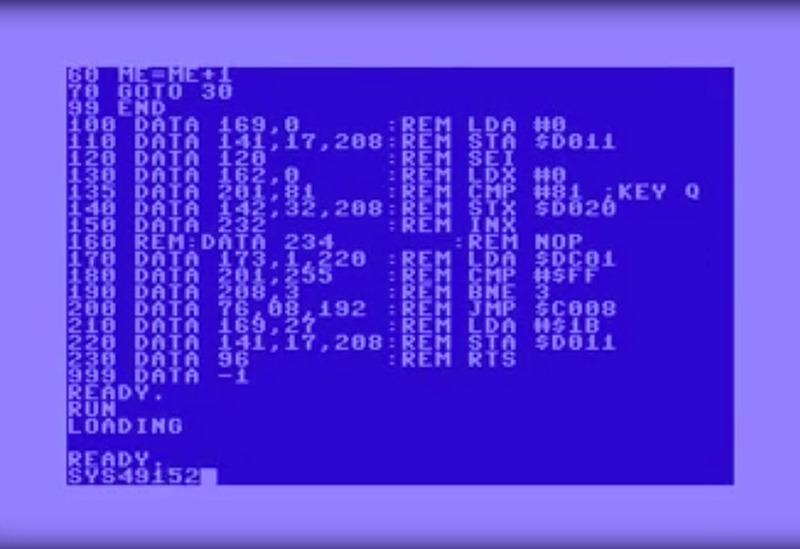 First, make a copy of the DH0:s/startup-sequence file in the Ram Disk. 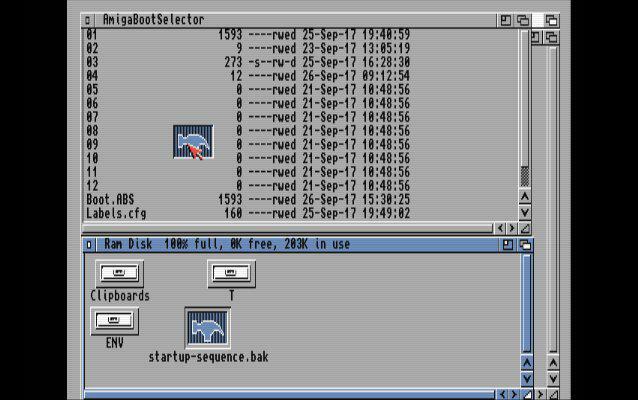 Click on the file in the Ram Disk then go to « rename » in the Icons menu and rename it to Startup-Sequence.bak. Copy the renamed file into the DH0: s folder. You will then have a backup copy in case of problems. You can also use a file manager to perform this operation faster. Directory Opus seems a good choice. 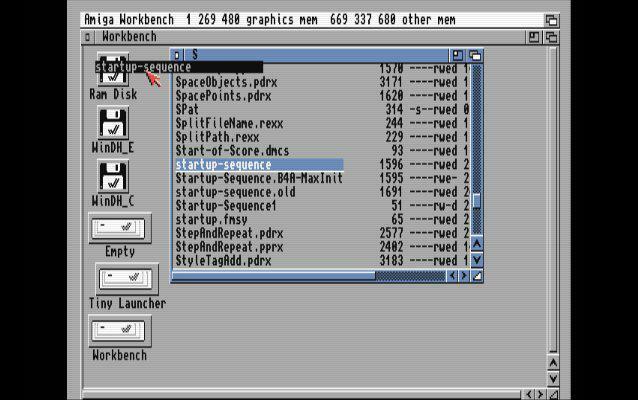 Select in Workbench menu «File/Execute Command…». Type ed and then press enter. When this step is completed, save the file as DH0:s/Startup-Sequence. 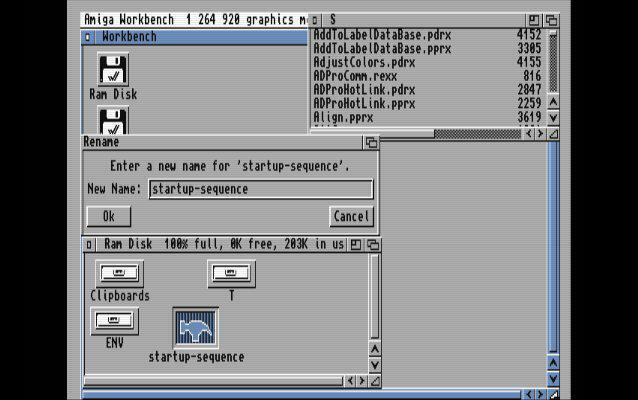 Reminder: you have a backup of your original Startup-Sequence if needed. Make a copy of your Startup-Sequence.bak in Ram Disk: to DH0:s/AmigaBootSelector. 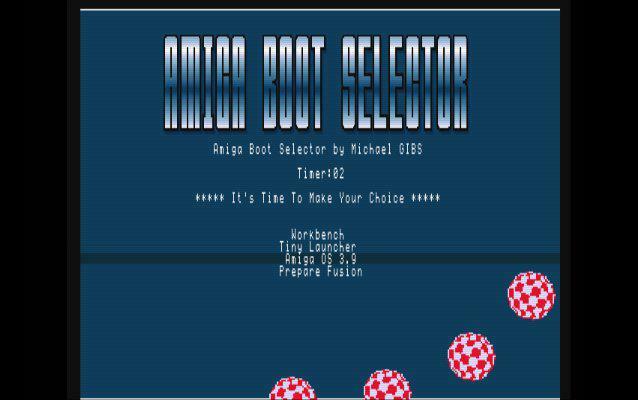 Delete the initial 01 file in DH0:s/AmigaBootSelector. 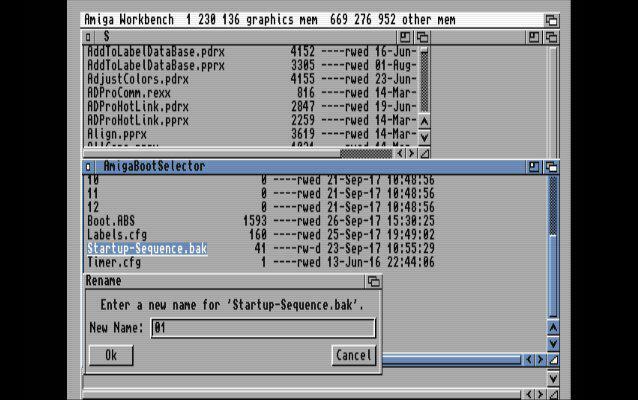 Rename the Startup-Sequence.bak file to 01. 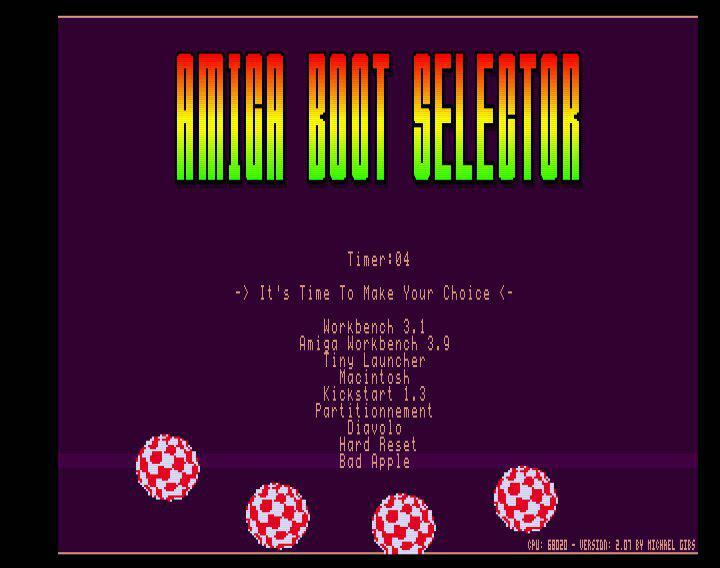 When your Amiga is restarted, you will arrive in Amiga Boot Selector. Press space to name your first choice. 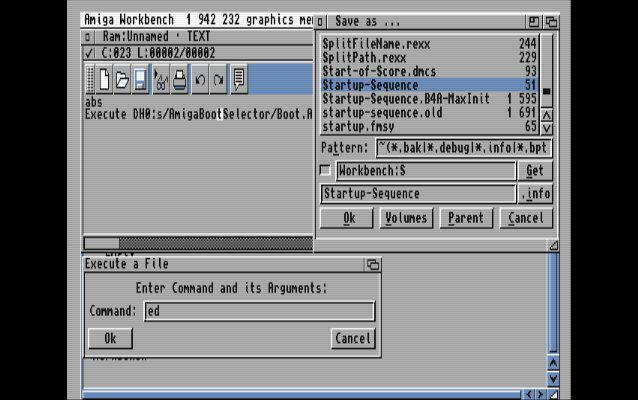 Restart the Workbench to edit the next choices (in the DH0 folder: S/AmigaBootSelector, Edit 02, 03, … as for your 01 if your various Startup-Sequences are already ready or by editing directly 02, 03, …). 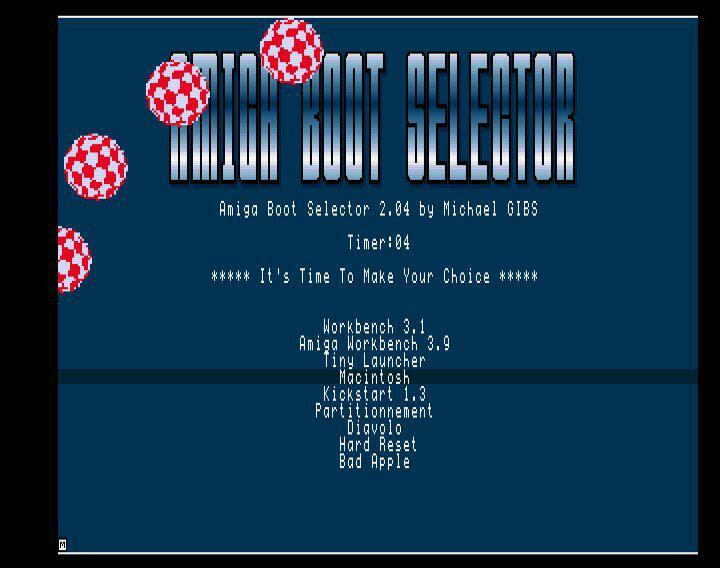 When you have returned to Amiga Boot Selector, select the second line and press space to name your next label (you will put the name of your choice). Repeat the operation if necessary with your other startups (third line then space for 03 and so on so). We assume that it is already installed on one of your partitions. To start, you have to look at which partition DHx (DH0 :, DH1:) … is your OS. We will now edit the label as explained above in this doc. 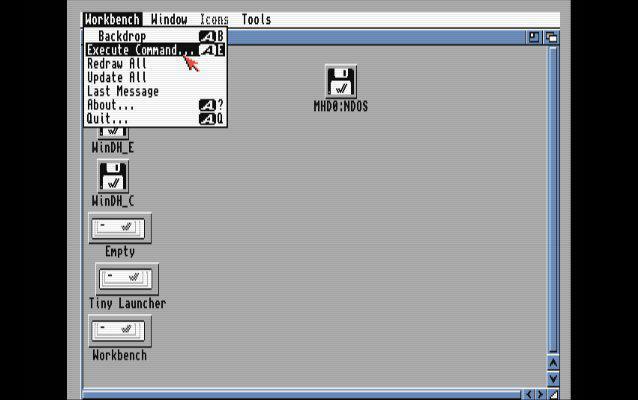 For this example, we will assume that OS 3.9 is on DH2: (but it can also be a WB 3.1). 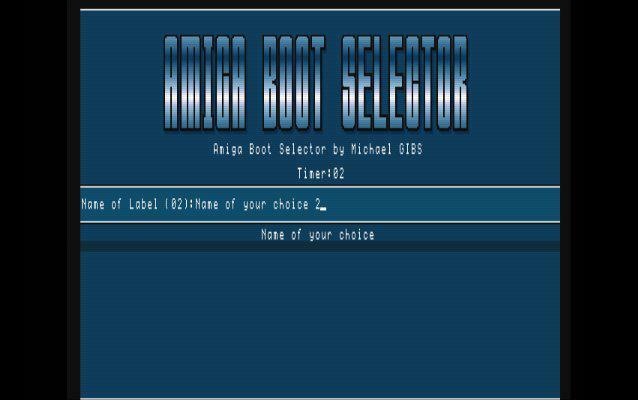 We will use the label 3 (s/AmigaBootSelector/03). The renaming of labels is now more ergonomic. Two new and very interesting features have been integrated since version 2.03. The first is the ability to navigate the menu with the joystick. The second is a switch that will allow you to automatically return to the last label you selected. It’s very simple, press the M key when starting abs. 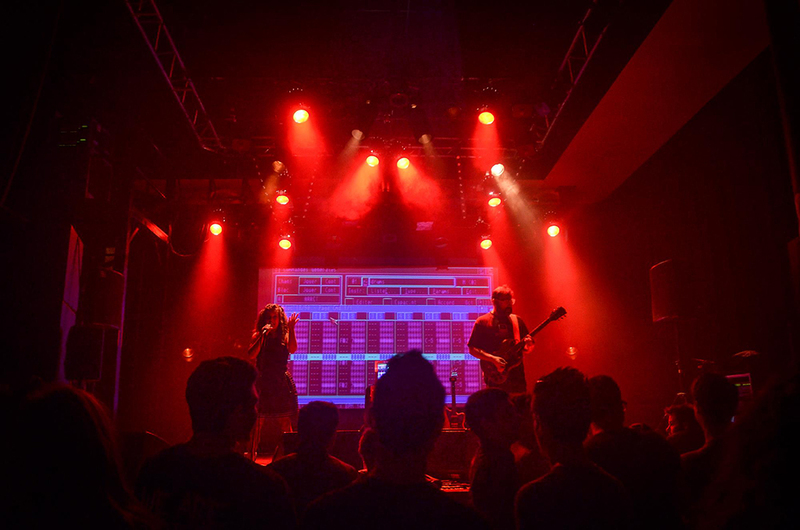 A small logo appears at the bottom left. Select your label and press enter. Returning to the menu, you will see that your last choice is automatically selected. With this new version 2.07, you will now have various aesthetic choices with two new switches. Indeed, following feedback from users, some found that the interface was more like a cracktro and because it was not very serious. 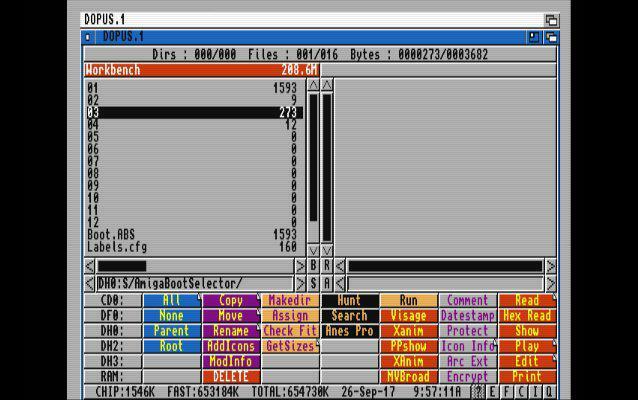 Never mind, Gibs now offers a new model in the colors of roms 2.0 and 3.1 as well as a return of the original interface named « Classic Boys ». Press K to move from one model to another. Press B to turn the boing ball on or off (not available on Classic Boys model). Ce sujet a 2 réponses, 3 participants et a été mis à jour par Zarnal, il y a 1 an et 3 mois. Thank you very much for this information. I’m happy. I want to be able to use two systems. 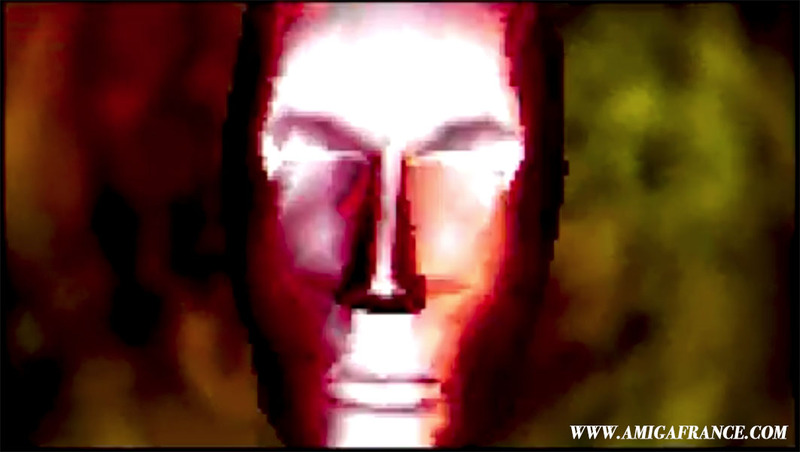 ClassicWB3.5 and AmigaSYS. 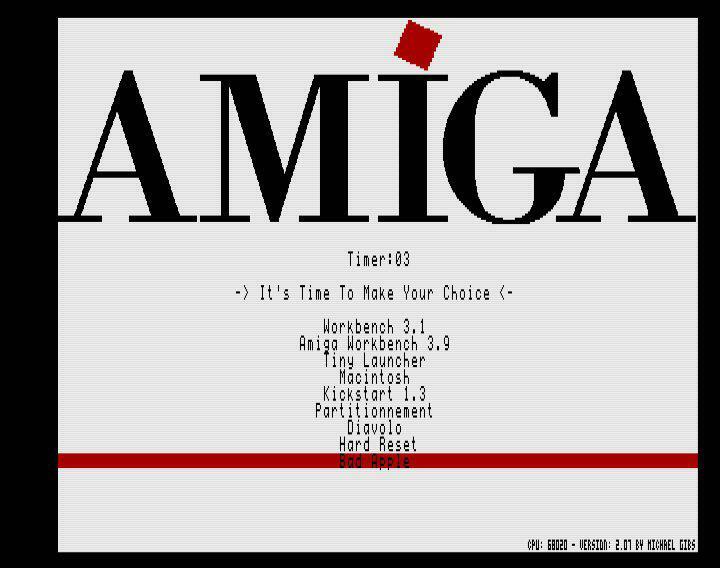 I used the commands that you reported on the site but it did not work for AmigaSYS. You could help me with the command as I believe it must be different. Again thank you very much and I await your help. 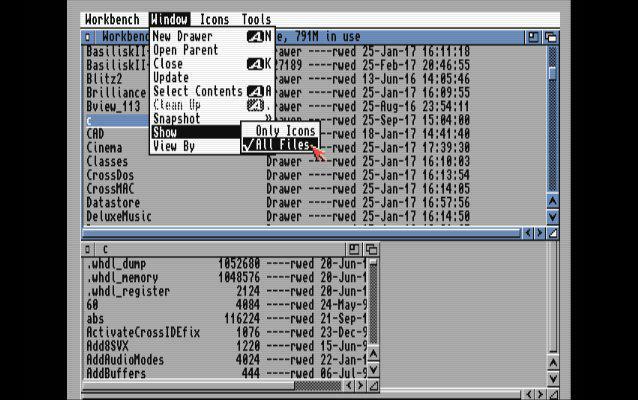 Do you use Winuae or real hardware ? I tested and it works (AGA version Hdf). You must replace » DH2: » with the name of your partition. » DH2: » in tutorial is only an example. 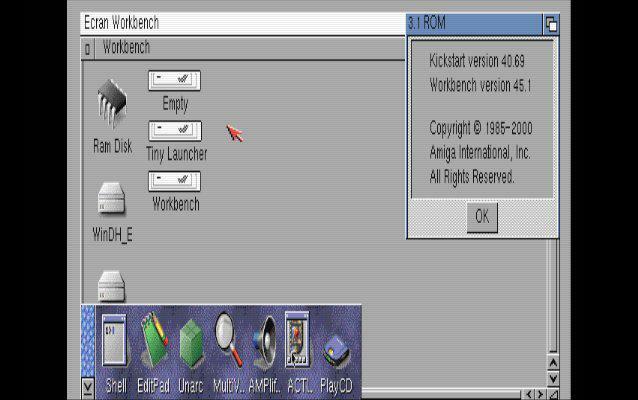 If your Workbench 3.5 is in DH0: and AMIGASYS in DH1:, replace all occurences of » DH2: » by » DH1: « .